Website designers serving the St. Louis area and beyond: do you need a website? At Response Builders, we employ state-of-the-art web technology to ensure your website is pleasing to the eye, quick to load, easily navigated as well as an effective marketing tool. Even the most basic website will benefit from visually pleasing graphics. Response Builders custom designs all the visual elements to be incorporated into our websites with the exception only of your existing corporate logos and photography. All graphics are tailored to match the image of your organization and your target audiences. 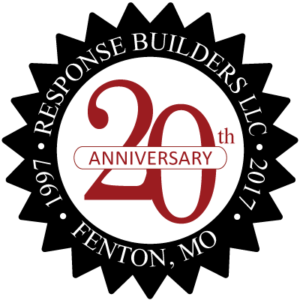 Response Builders constructs websites with appropriate page layout that is not only pleasing to the eye but also easily navigated. Good page layout not only establishes the consistency of the site, it provides an element of familiarity that will aid visitors in message comprehension and navigation. Our goal is to use page layout to facilitate the communication of your message through the unique look and feel of the site. Furthermore, our websites are designed to be easily viewed on all monitors and devices. Website navigation must be obvious and easy. Awkward navigation will frustrate site viewers and drive away traffic. Response Builders will integrate both text and graphical navigational links throughout the website ensuring an easy flow through the site. In addition, pages will be inter-connected through the use of text links added within the copy of the site. Response Builders routinely views each site through multiple browsers, on multiple devices. Browsers tend to interpret HTML tags differently resulting in skewed or misaligned content in one browser versus another, one device versus another. After the initial web development has been completed we will view all pages of the site through multiple browsers, on multiple devices. Contact Response Builders to schedule a free web design consultation. Located here in St. Louis? Ask us about a no-obligation face-to-face meeting to discuss your upcoming project.